The lines of Ham and Shem intermarried. Further evidence is found with the names Lud and Ludim (Ludites). In Genesis 10, Lud is named as a son of Shem and in Genesis 10:13, the Ludim are said to be of Ham. Bible passages that speak about “the Canaanites” reflect authors who lived well after the time of the Patriarchs. In Genesis 10 the peoples who descend from Noah through his grandsons Sidon and Het (Heth) are said to be the original inhabitants. The Canaanites were blood-related Afro-Arabian peoples whose ancestry can be traced back to the Nile Valley and to ancient Kush. Israelites married Canaanites. Rahab’s marriage to Salmon, of the tribe of Judah, is but one example. 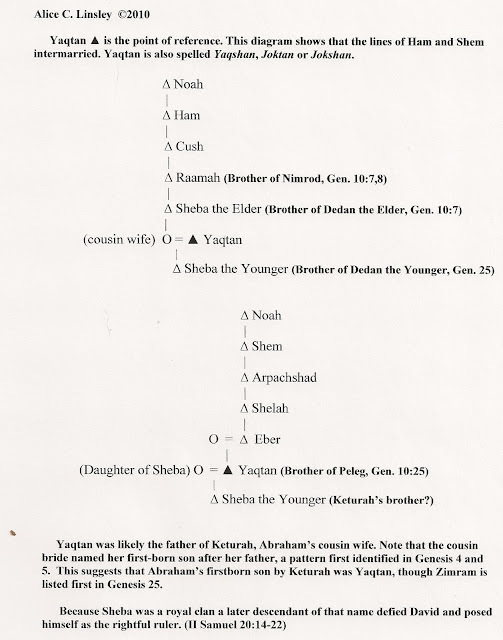 Analysis of the marriage and ascendancy pattern of Abraham's Horite caste makes it clear that the descendants of Ham intermarried with the descendants of Shem, and Jesus Christ is a descendant of both lines. As far as the evidence goes, Shem and Ham had the same God and their ruler-priest lines intermarried, as shown in the diagram. 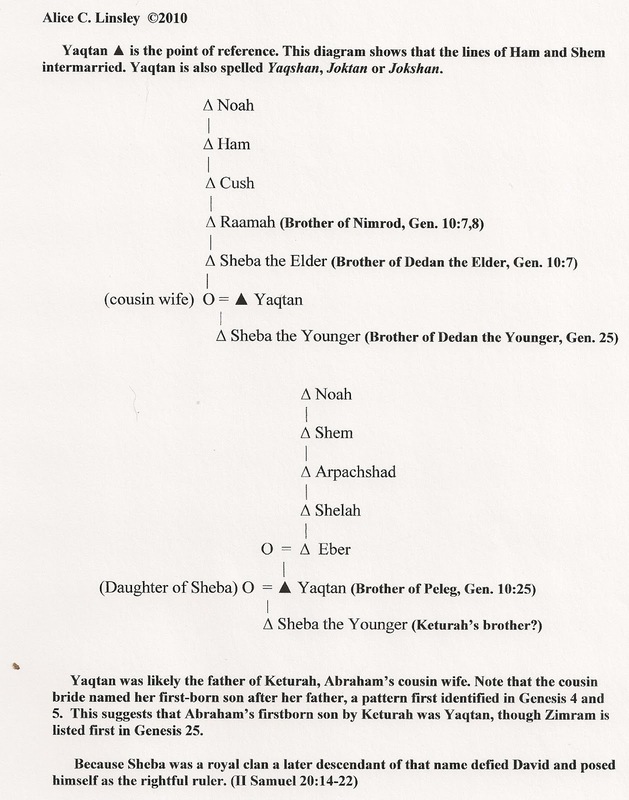 The daughter of Sheba the Elder married Joktan (Yaqtan) and named their first born son Sheba after her father, according to the cousin bride's naming prerogative. The association of Shem, the Father of Eber, with the Hebrews does not mean that Ha-Shem is the God of the Hebrew people alone. This view rests on an flawed etymological assumption. Shem is considered “the father" of all the Hebrew people, assuming that the word Hebrew comes from Eber. However, it is more likely that it comes from the word Habiru (Hapiru). The Horite ruler-priests were Habiru. HBR is the root of the words Habiru and Hebrew. Eber was the father of two firstborn sons by his two wives. His sons were Joktan (Yaqtan) and Peleg. Joktan was the son of his cousin wife and the heir to the throne of Eber's father-in-law in Southern Arabia. Joktan was the founder of the Joktanite clans of Arabia. Abraham's firstborn son was named Joktan after this famous ancestor. Eber's sons became the founding patriarchs of two linguistically distinct Afro-Asiatic groups: the Afro-Arabians and the Afro-Asians. Apparently, the Kushites became divided linguistically after the time of Eber's death around 2303 B.C. Shem is one of many honorific titles found in the Genesis King Lists. Others include Cain, Enoch, and Lamech. The words king and Khan are related to the word Kain (Cain). The related word for queen is Kandake (rendered "Candace" in English Bibles). The Bible tells us many details about Cain, all of them pointing to his rank as a ruler. When he was born his mother declared kan-itti. E.A. Speiser noted that Qany(ty) or Qan itti shows close affinity to the Akkadian itti, as in itti šarrim, which means "with the king". Akkadian was the language of the empire during Nimrod's time (BC 2290-2215). Genesis 10 tells us that Nimrod was a Kushite, so it is not surprising to find that Akkadian shares many words with Nilotic languages. Among the Oromo of Ethiopia and Somalia, itti is attached to names. Examples include Kaartuumitti, Finfinneetti and Dimashqitti. That itti is associated with Nilotic rulers is evident in the name Nefertitti. Enoch is also a royal title. It is related to the word Anochi which means "heir to the throne" or "one who ascends." Lamech is a variant of the Egyptian la-melech, which has been found on hundreds of seals. La-melech means "of the King." The la-melech seal typically had the image of a scarab or a sun disc, the emblem of the Creator. The sun disc was used as a royal seal by the Kings of Judah who were direct descendants of Cain and Seth whose lines intermarried. Very helpful information here. Thanks. I have a question on the origin of the word 'Hebrew'. As you mentioned, the 2 common explanations are 1) Eber and 2) Habiru. I understand that etymologically 'Habiru/Hapiru' would be a better fit with the HBR root but religiously and politically wouldn't the Israelites have abandoned Egyptian terms and gods (Horus, Ra, the nile) since the Exodus from Egypt and establishing Israel in Canaan was anti-Egyptian? Also, if the name YHWH connects to Horus, is Horus the real God of Israel? The people of Yisrael were the biological descendants of the Horites. Jews call their ancestors "Horim" which is Horite in English Bibles. There is very little said against Egypt in the Bible. In fact, Egypt is generally regarded as a safe place for God's people. During times of famine,the people of Canaan went to Egypt and received food there. It was to Egypt that the angel told Joseph to take Mary and the Christ Child. Egypt factors more positively in biblical narratives than negatively. Thanks for the info and I read the linked article. It is very insightful. But what are we to conclude as Christians if the gods Horus, Osiris, Hathor and Ra are the original idols of worship of the Horite influenced Israelites? By using the description Yahweh, was Israel and are we giving reverence to Horus and Ra? Please clarify this when you get a chance. Osiris was another name for Ra. Hathor-Meri was later called Isis. Osiris and Isis represent later interpretations that corrupted the earlier pattern of Father, Son and Virgin Queen. This is due to syncretism among the Egyptians well after the time of Abraham. YHWH is a name that restored the older Nilo-Saharan context.